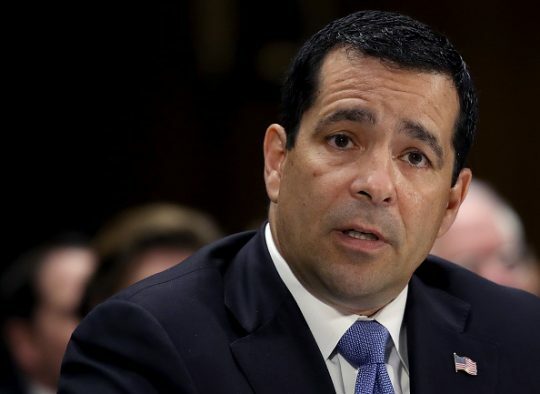 Top U.S. Counterintelligence Official: China Is Devoting 'Ungodly Resources' to Conduct Espionage Against U.S.
Top U.S. Counterintelligence Official: China Is Devoting ‘Ungodly Resources’ to Conduct Espionage Against U.S.
William Evanina, the country's top counterintelligence official, sounded the alarm on Tuesday about China devoting "ungodly resources" and waging "more aggressive" tactics to conduct espionage against the United States. Evanina, who has served as director of the National Counterintelligence and Security Center since 2014, appeared on the Sept. 4 "Intelligence Matters" podcast episode with CBS News senior national security contributor Michael Morell, where the pair discussed China's ongoing espionage war on the United States and how the country is in a category of its own compared to Russia and Iran. "It's a persistent thousand grains of sand," Evanina said. "They hit our academia, our industry, our research development, and obviously our government. The FBI has arrested double-digit individuals in the last year or so—all for spying on behalf of China." "China is number one," he said. "Existentially, long term, they're the largest threat to our national security, bar none—it's not even close." "They bring ungodly resources that we can't handle right now," he added. Over the last several months, national security officials, including FBI Director Christopher Wray, have warned about China's espionage capabilities. Wray spoke at the Aspen Security Forum in July where he warned about China from a counterintelligence perspective, saying the nation represents "the broadest, most challenging threat we face at this time," according to CBS News. "The volume of it, the pervasiveness of it, the significance of it, is something this country cannot underestimate," Wray said. Evanina echoed Wray's assessment, talking about China's economic and cyber espionage efforts to target U.S. intellectual property and critical infrastructure. He said there was a brief pause in their activities in 2015 after former President Barack Obama and Chinese President Xi Jinping pledged to refrain from computer-enabled theft of intellectual property for commercial gain. However, the pause was short-lived and China soon resumed its original pace. "It's too successful for the Chinese to stop their theft," Evanina said. "They have the numbers, the resources; they have the will and the intent." "And they're intent to have a holistic mindset, a whole-government mindset [on] how to take from us what they need," he emphasized. Evanina also spoke about the evolution of Russia's espionage tactics. He observed that, like China, Russia's espionage tactics have evolved to take advantage of Americans' open-society traditions. Referring to the recent indictment of alleged Russian agent Maria Butina, he said, "I think you'll see the progress now with Maria [Butina] here, that they realize that opportunity hiding in plain sight is the ability to work here in the U.S. with open society." Butina was charged in July with conspiracy to act as an agent of Russia, including by building ties to the leadership of the National Rifle Association and other conservative political organizations. Prior to joining the NCSC, Evanina served as chief of the Counterespionage Group for the Central Intelligence Agency (CIA) and worked for the FBI. While at the latter, he was part of a team that for years surveilled a network of Russian intelligence agents that operated without diplomatic protection as so-called "illegals." His arrests in 2010 led to a high-level prisoner exchange between the United States and Russia. The NCSC director suggested Russian and Chinese intelligence services have ramped up their operations in areas beyond the territorial United States, including Africa, Mexico and Cuba. He said Cuba was on top of his "worry list." "The capabilities … with the Cuban Intelligence Service for decades are silent but deadly," he said. "But when you add the amount of Russian intelligence services now and Chinese intelligence services on the island of Cuba, it becomes a very problematic geographic area for us." This entry was posted in National Security and tagged Barack Obama, China, Intelligence, Iran, Russia. Bookmark the permalink.